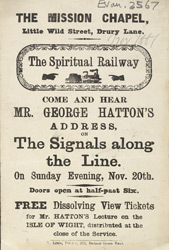 This leaflet is for a lecture by Charles Hatten. At the end of the lecture tickets were given away to a lantern show of images of the Isle of Whight. Lantern shows were a very popular form of entertainment in the 19th Century and ‘Dissolving views’ were especially popular. With the use of two synchronised lanterns it was possible to perform a slow transformation from one image to another, giving the illusion of movement. A sailor could be made to dance, a volcano would erupt, spewing lave and a summer landscape would suddenly be cloaked in snow.